May 2011 sees the 35th (yes 35th ) anniversary of Rainbow’s Rising album, an album underrated by many, but today sounds as great as it ever did, and then some. To be totally honest I have to nail my colours to the mast. Rising was the first ‘proper’ album I purchased along with ‘Deepest Purple’ back in 1980. It’s this album that set me on my way for all the music I love still today. It is a classic piece of work, and a testament to the work of Blackmore and Dio, who really should have created more than they did. Blackmore tinkered way too much, as this was THE definitive Rainbow line up. Fed up with the lounge-esque Elf line-up, some steel was added with the force of Cozy Powell’s drumming, the pounding bass of Jimmy Bain, and Tony Carey who could match Blackmore’s classical dexterity note for note and was no longer the ‘Ritchie and Ronnie’ show. ‘Rising’ captured the band at their peak. Even the album sleeve was a work of art. Ken Kelly’s iconic work was meant to grace an album cover. Somewhat diminished on CD, it still remains a striking piece – the little touches of a guard in the corner looking out to the sea, and an owl perched on top of the cliffs. If there ever was a starting point to tell people what albums to listen to (from any era of rock) ‘Rising’ would be high upon my list. Not just for a glimpse into the many faces of Rainbow, but Rock/Metal in general – this was a heavy as Rainbow ever got. A couple of years later, this formula was lost trying to chase chart success in the US., which some may argue was a better version. I wholeheartedly disagree despite my love for JLT. 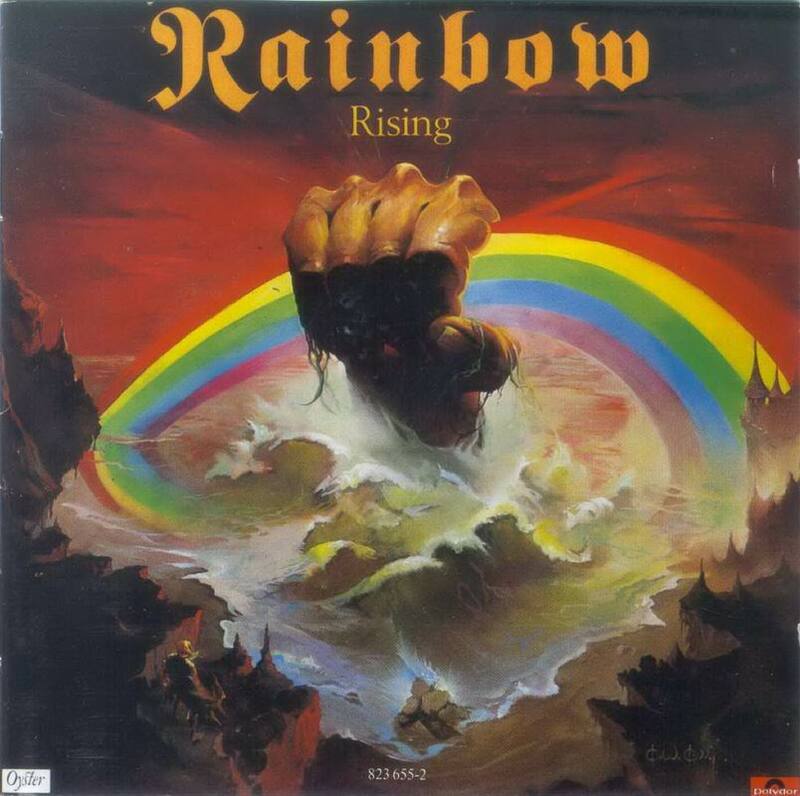 When people talk about Metal in the 70s, Sabbath, Priest and Led Zep come to the fore, but, Rainbow’s ‘Rising’ is an album whose quality dictates that it should be talked about in the same vein. Rising went on to achieve formidable chart success reaching number 48 in the U.S. and an impressive number 6 in the U.K. This was the album that saw Rainbow equalling anything that Blackmore's previous band, Deep Purple had ever produced. 1-0 Ritchie! Weighing in at just 33mins and 28secs (’76 era meant that any more than 40mins equalled a loss in quality) and just 6 songs, ‘Rising’ literally rose above the parapet with an album of pure unadulterated quality. Right from the off you can tell that 'Rising' is a thing of beauty, and it’s the sound of a band on FIRE. Carey’s majestic Minimoog solo intro to Tarot Woman was apparently his first take, before Blackmore’s riff, and Powell’s blistering drum beat kicks in. Ronnie James Dio has never sounded better (or more ferocious), and Blackmore’s playing was sublime. Even the (so called) lesser talked about tracks like ‘Run With The Wolf’ lamenting, ‘’there’s a hole in the sky, something evil’s passing by’’ and ‘Do You Close Your Eyes’ are classics nonetheless. ‘Starstruck’,a song that made the live set-up is about a Blackmore stalker. The undoubted star of the album was the epic Eastern sounding 'Stargazer'. Blackmore had recently taken up to playing the cello, and used it as a compositional tool, the riff came from practising with his newfound instrument. The track is eight and a half minutes of exquisite power and absolute majesty. It combines Blackmore’s love of classical music, together with Dio’s vivid fantasy inspired lyrics ‘’see how he glides, why he’s lighter than air’’, ‘’my eyes are bleeding’’ and ‘’Where is your staaaar, is it far, is it far, faaaaarrrr’’, with Blackmore’s uninhibited guitar playing and slide work highlighting the whole piece. Last up is the (almost) equally impressive ‘A Light In The Black’ which is a much faster song than anything previous. Cozy thundered his way thru the album, and the addition of Bain and Carey was a masterstroke. Dio complemented Blackmore’s style perfectly and the bloke literally sung his arse off – did he ever sound better than this? The CD package has been lovingly put together, with detailed sleeve notes, pics that weren’t on the original album, all still in a gatefold style version similar to the original (only smaller). Any self respecting Rainbow (or any Rock fan come to think of it) fan will lovingly enjoy the overall package. For me, it’s one of those albums in the ‘every home should have one’ stable. It really is that good!